It’s hard to believe that only a year ago Fortnite was released. Originally a game that had been in development for years, it eventually evolved into one of the most popular games of this generation with the addition of its Battle Royale mode. For the next week until Aug 7, Epic Games is celebrating the release of the original game mode, the Save the World campaign, by giving out some birthday goodies for players. - Play 14 matches to unlock 5,000 XP. - Complete the Fortnite Birthday questline in Save the World and earn the Birthday Brigade Ramirez Hero! - Earn tickets to spend on Birthday Llamas which can contain Heroes and weapons from every event this year (not including quest rewards). Players who are fans of the game’s Battle Royale mode won’t have to worry about being left out of the celebration. The popular mode will add birthday cakes on the map with consumable slices that give players health and shields. 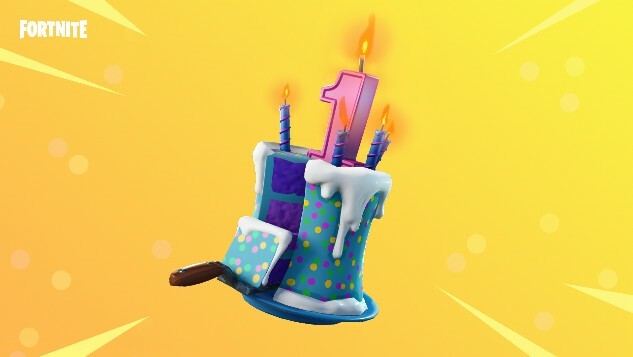 Completing birthday 3 challenges will also unlock special emotes, sprays, and backbling. Last but not least, the battlebus and supply drops will receive cosmetic changes to match the birthday celebration. These changes come with Fortnite’s 5.10 update today and last until Aug. 7. You can read the full list of patch notes for the game on Fortnite’s website.